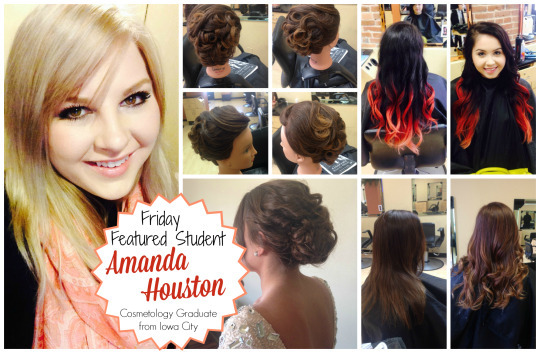 New LJIC graduate, Amanda Houston, pushes the boundaries of style, cosmetology and the latest hair trends. “I’m a total hair nerd.” That’s Amanda Houston talking. She’s LJIC’s Featured Student of the Week. She’s calling herself a hair nerd and we kind of like the sound of it. Amanda told us that being a “hair nerd” means being consumed by style, trends, and new techniques. She’s consistently trying to make herself better. She’s always improving her craft, looking at magazines and searching the Internet for anything new in the industry. We’ve talked to Amanda, and she doesn’t seem very nerdy to us, but whatever you want to call her, she has a drive to excel and the kind of attitude that it takes to succeed in the cosmetology industry. In addition to her state certificates and diploma in cosmetology, Amanda won second place overall in LJIC’s annual Trend Vision competition and fashion showcase. She’s also developed a strong relationship with her instructors and she’s even developing a rapport with her regular clientele. “I cannot wait to push boundaries as a stylist,” she says. And no matter what Amanda says, we think that’s pretty cool!